Dulaang UP (DUP), the official performing group for theater of the University of the Philippines, will close its 38th theatrical season this coming February with Ang Nawalang Kapatid (ANK), a musical based on The Mahabharata, an Indian epic considered to be the longest poem in the world. The Mahabharata tells the story of Karna, a brave young man who must choose between loyalty to his family or to the state which made him a prince. A key subplot here is the fierce competition between the Kaurava and Pandava families. Ang Nawalang Kapatid is developed by acclaimed playwright Floy Quintos, with original score by Ceejay Javier. Javier’s previous works include “Isang Panaginip na Fili,” “Astig,” “Alex in Wonderland,” and “Break Away Antigone.” It will be directed and choreographed by Dexter M. Santos (“Maxie the Musical,” “Collection,” “Orosman at Zafira”). “’Ang Nawalang Kapatid’ was originally written as a children’s play for the Ateneo Children’s Theater and was first produced for their 2011 season. This new version allows for many more of the complexities of the original material to be dramatized,” Dulaang UP said in a statement. Quintos’s adaptation, the group added, will highlight the theme of family and blood ties as well as the conflicts that these bring about. Karna, originally portrayed in Indian literature as an anti-hero, will now be seen as a young man searching for his dharma, his truth and destiny, while unaware of his true blood ties. With ANK, Dulaang UP seeks to bring the timeless story of The Mahabharata to a more diverse audience. It will also underscore how the said epic mirrored strong values like loyalty to family, a trait particularly associated with Filipinos and other Southeast Asians. 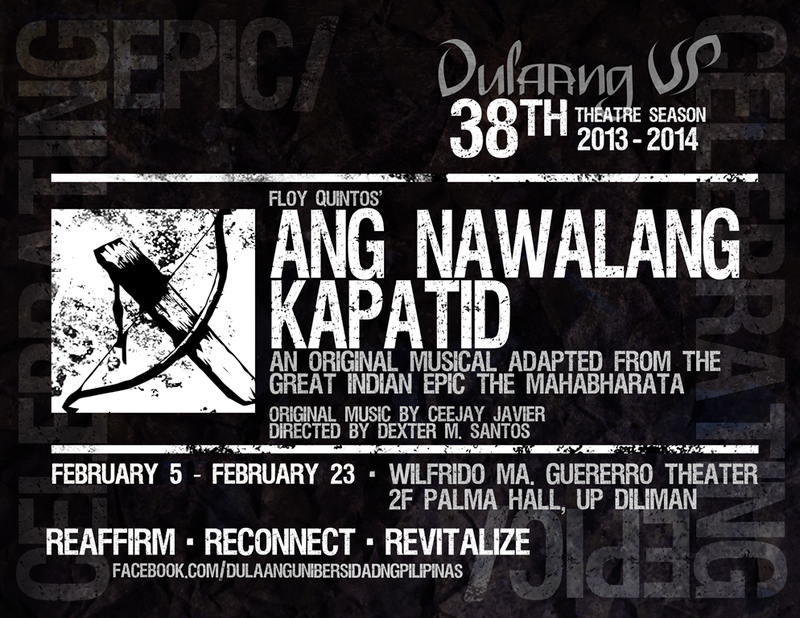 Ang Nawalang Kapatid will run from February 5 to 23, 2014. All performances will be at the Wilfrido Ma. Guerrero Theatre in University of the Philippines-Diliman (Palma Hall, 2nd floor). Contact the office of Dulaang UP at 926-1349, 981-8500 local 2449 or 433-7840 (look for Samanta Hannah Clarin or Camille Guevara) or email them at dulaangupmarketing@gmail.com for sponsorship and ticket inquiries. PS: Dulaang UP began its current season with ‘Adarna,’ which ran last July. This entry was posted on Monday, January 27th, 2014 at 1:08 am	and tagged with Ang Nawalang Anak, Ang Nawalang Anak Dulaang UP, Ang Nawalang Anak review, Ang Nawalang Anak stage play, Dulaang UP, Dulaang UP 2014 schedule, stage plays philippines 2014, theater plays philippines 2013 and posted in hodgepodge, up diliman. You can follow any responses to this entry through the RSS 2.0 feed.